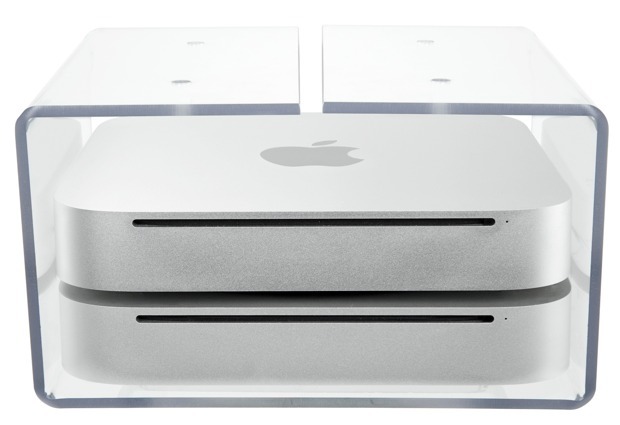 Adding to the minimalism that is Mac Mini, NewerTech has announced the NuShelf Mount case for mounting a Mini or Time Capsule under a desk. The case is made of clear thick acrylic and rear slots have been cut out for SD cards and cable feeding. There are two versions: single and dual device shelves. The single NuShelf mount costs $39.95 and the NuShelf Dual Mount costs $44.95. Buy them here. March 11, 2011, Woodstock, IL — Newer Technology, Inc. (NewerTech®) http://www.newertech.com, a leading developer of Macintosh®, PC, iPod®, iPhone®, and iPad® performance upgrades and accessories, announced today the NewerTech NuShelf Mount for installing one or more 2010 Mac mini computers and/or Apple Time Capsule wireless hard drives under a desk, shelf, or cabinet. Designed and Made in the USA and priced starting from $39.95 MSRP, the precision manufactured acrylic NuShelf Mount is an ideal solution for saving desktop space by relocating a 2010 Mac mini and/or Time Capsule to a more protected, unused mounting location. Both NuShelf Mounts offer easy access to all the Mac mini’s ports and power button while the front of the brackets remain open for accessing the mini’s optical drive and to keep the Apple Remote sensor unobstructed. 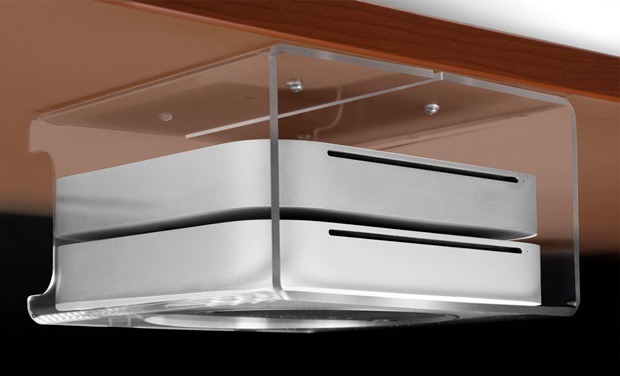 Openings on the bottom of the bracket, along with additional space above the mini, provide adequate ventilation to keep the Mac mini cool. Precision laser cut, recessed bottom seats Mac mini securely into stand. Backstops keep Mac mini from sliding out back of shelf. Dimensions: 8.1″ x 8.1″ x 3.6″ (20.7cm x 20.7cm x 9.2cm).